T-L Photo/KIM NORTH RIVER’S Candace Caldwell slides safely into second base Thursday as Barnesville shortstop Cayleigh Reynolds tried to get a grip on the softball. Caldwell was credited with a stolen base on the play. The Pilots won, 7-6. SARDIS — Softball coaches, as well as baseball, are always preaching to their players to put the ball in play. Anything can, and sometimes, happens when that is achieved. 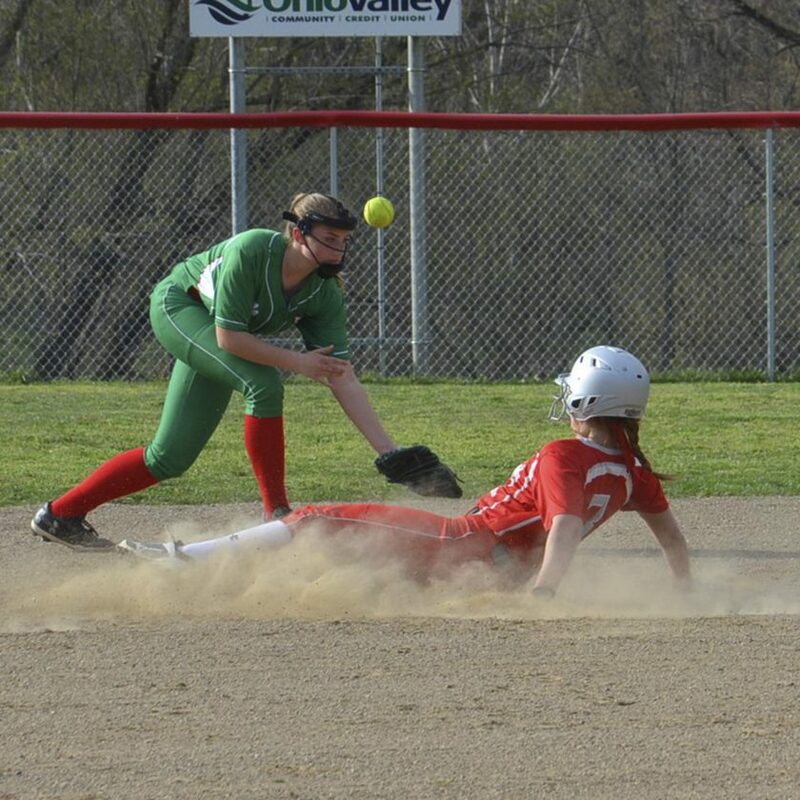 Livi Rose raced home from third base with the winning run in the bottom of the seventh inning Thursday when Jonayah Moeller’s groundball with two outs was bobbled, allowing River (6-4) to navigate its way past visiting Barnesville, 7-6, in softball action. Rose led off the bottom of the seventh with a ringing double to left. She moved to third when Katie Rufener’s comebacker deflected off of pitcher Regan Hanlon’s glove. The ball trickled to shortstop Cayleigh Reynolds who threw Rufener out at first. Hanlon, who relieved Madison Detling in the sixth, struck out the next batter before Moeller’s bouncer on a 1-1 pitch was misplayed. “We tried to bunt her to third,” River head coach Dave Wright said of two unsuccessful attempts by Rufener before her grounder eventually did the trick. “When you have a runner on third there are a lot of good things that can happen. That’s the way it played out today. “There’s no quit in these girls. That’s what I like about this team, they never quit and battle until the final out,” Wright added. For the Shamrocks (7-8), it marked the second consecutive heartbreaking loss in Monroe County following a 5-4 setback at Monroe Central Wednesday night in nine innings. Barnesville scored four times in the top of the third with Hanlon driving in a pair. Reynolds added an RBI single while the fourth tally crossed via an error. River answered right back as Candace Caldwell, Rose and Rufener all rapped back-to-back-to-back RBI hits to make it 4-3. The Pilots went ahead an inning later when Riley Lollathin doubled in a run and Lindsay Huffman’s sacrifice fly made it 5-4. Not to be outdone, the Shamrocks scored twice in the top of the fifth as a pair of Pilots errors paved the way for a 6-5 advantage. Mikeala West knocked in the sixth run with a sacrifice fly. An unearned run in the bottom of the inning allowed River to draw even as Rose scampered home. Neither team dented the scoreboard in the sixth or home half of the seventh, setting the stage for the late-game dramatics. Rose finished with two doubles, a single and an RBI, while Caldwell drove in a run with a single and double. Katie Lively went the distance inside the circle for River. She struck out five and walked one while scattering nine hits. The Pilots remain at home today as Monroe Central visits. Barnesville travels to Sarahsville to meet Shenandoah.